This teaching is the first of a two-part study looking at the Feasts of Israel and their prophetic significance. 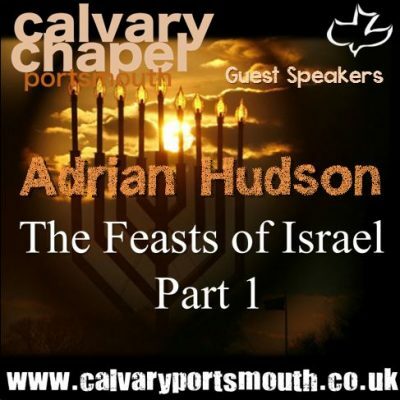 This teaching was given by guest speaker, Adrian Hudson, on 14th April 2019 as part of Calvary Chapel Portsmouth’s family service. The Feast of Unleavened Bread, which alludes to the spotless, sinless Christ who was put into the ground like a grain of wheat, that He might rise again bearing much fruit. In this study, Adrian takes us through these three feasts + Shavuot (The Feast of Harvest / Pentecost) showing the incredible design which show the Author of the Bible to be outside of time and space, telling the end from the beginning, and from ancient times the things not yet done! (Isaiah 46:9-10). Only God could conceal the incredible details found in the Feasts of Israel that act as a model given over 1400 years in advance of Jesus, death, burial and resurrection! May you be blessed and encouraged by this teaching. The Audio and Powerpoint slides (in PDF format) used in this teaching are available for free download.